Swedish Hasselback Potatoes look like a work of art and, when baked with this delicious lemon, garlic dijon vinaigrette, they are as tasty as they are beautiful! 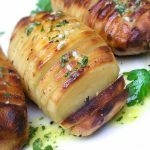 I’ve always been attracted to Hasselback potatoes but never made them or knew much about them until now. 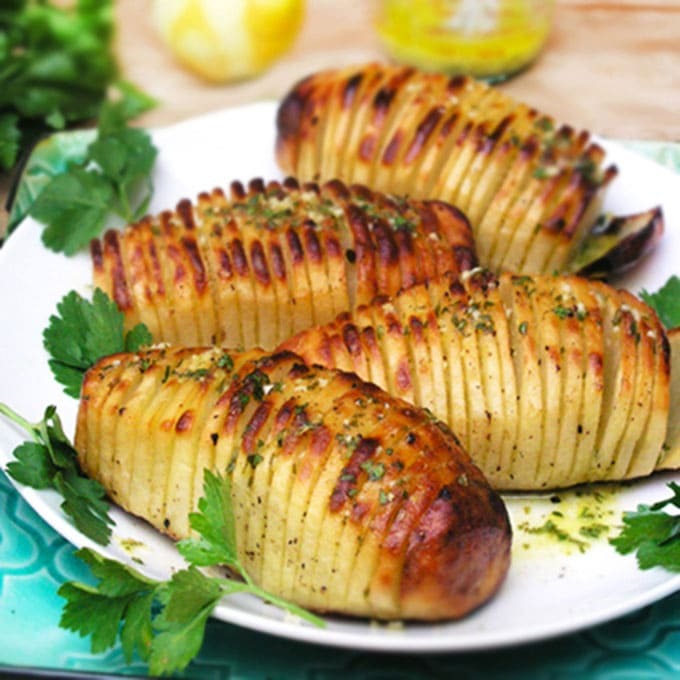 I think potatoes are irresistible in almost any form – baked, mashed, roasted, french fried… but there is something about Hasselbacks that grab the eye – they look like a work of art – an exotic caterpillar – an accordion. 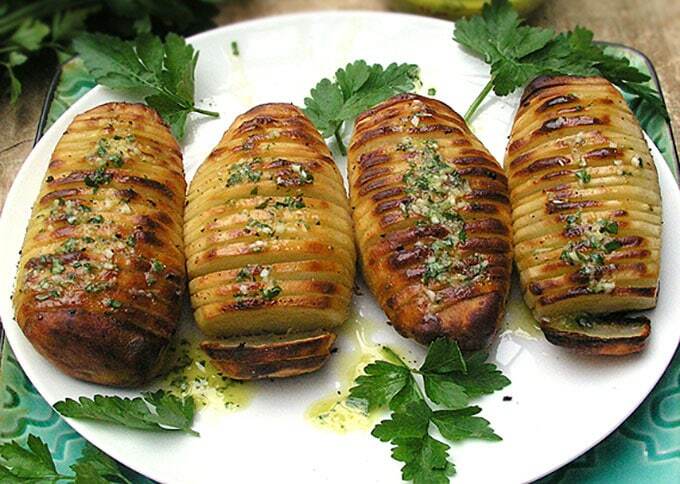 I came across Hasselbacks again last week, as I was doing some research about Swedish cuisine for Panning The Globe. 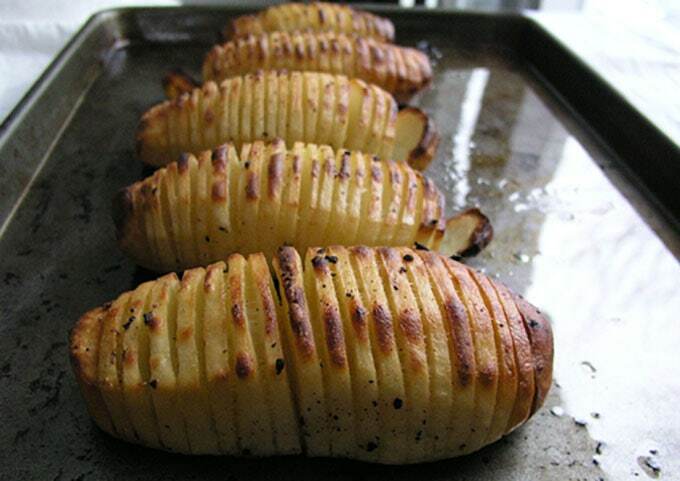 Turns out they were invented in the 1940s by a Stockholm restaurant called Hasselbacken. I decided it was time to give them try. They key to making Hasselback Potatoes is to make lots of slices across the whole length of a potato, leaving enough in tact at the bottom to hold the potato together. When the potato is baked, it fans open. The traditional Swedish recipe calls for rubbing the potatoes with butter and adding bread crumbs and more butter towards the end of cooking. The very good news was that it was super easy to cut the potatoes and get them into the oven. Unfortunately though my first couple of batches tasted pretty much like plain old baked potatoes. Baked potatoes are great but they need to be mashed up with something to make them really tasty. The Hasselbacks looked gorgeous but the flavor didn’t match the excitement of the presentation and I felt like they were too pretty to mash up with butter and salt. One of my secret weapons in cooking is my lemon dijon dressing. When in doubt, I marinate with it or pour it over things and it always does its magic. I decided to try it out on the potatoes. I added a bit more garlic than usual and tossed the potatoes in the dressing before baking. Once the slits started fanning out, I added a bit more dressing. For the final dressing, I added chopped parsley and lemon zest, which I spooned over the potatoes before serving. I was extremely happy with the outcome. They were crisp on the outside and creamy on the inside, and had tons of zesty flavor from the dressing. And they were so pretty I couldn’t stop photographing them! • Swedish Glögg: Hot spiced mulled wine. 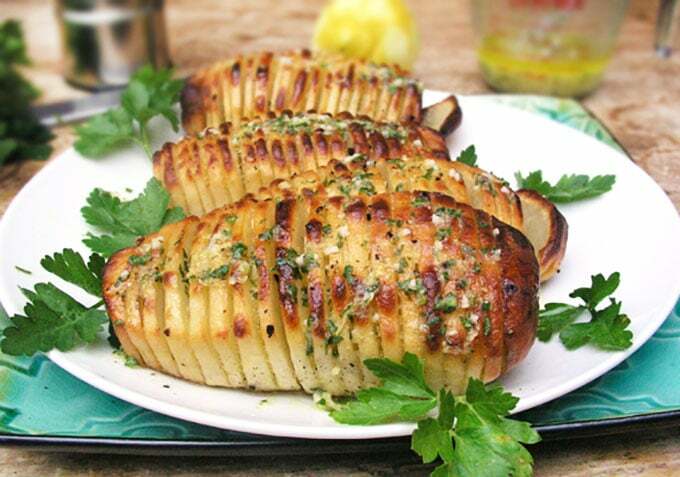 Here’s the recipe for Hasselback Potatoes with lemon garlic dijon dressing baked in. If you try this recipe, I hope you’ll come back to leave a comment and let me know what you think! 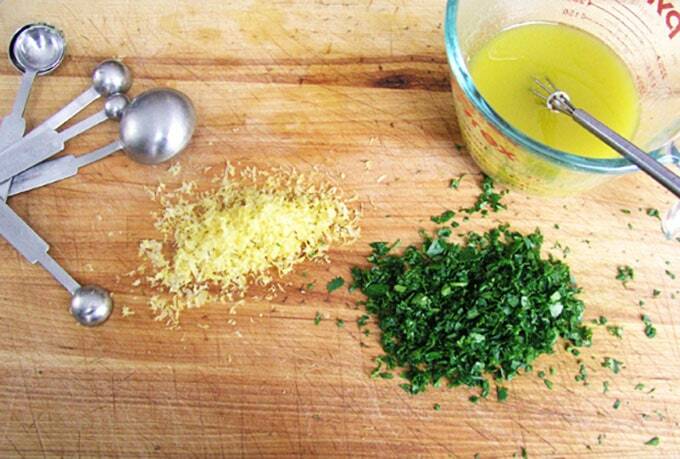 Make the dressing Whisk olive oil, lemon juice, garlic, mustard, salt and pepper in a small bowl. Set aside, keeping the dressing at room temperature. Peel and slice the potatoes: Peel the skin off the potatoes with a vegetable peeler, scraping a bit of potato off the bottom to make a flat stable surface, so they don’t roll around when you’re slicing them and dressing them. 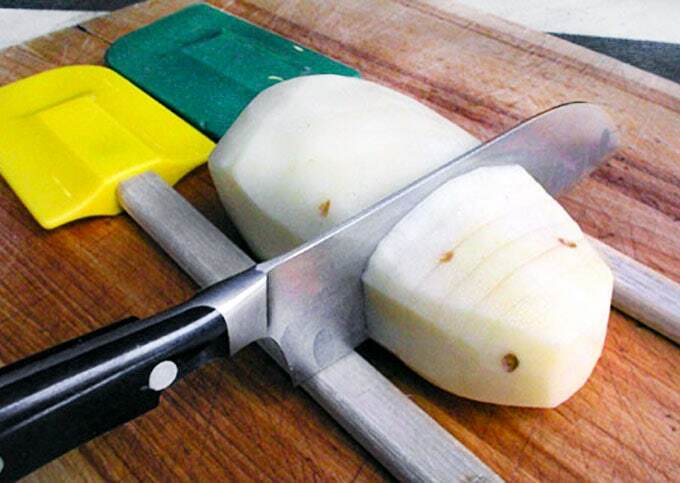 Make slices, about 1/4 of an inch apart, along the length of the potato, but stopping the cut about 1/4 of an inch from the bottom so the potato holds together. An easy way to keep from cutting all the way through, is to lay the potatoes lengthwise between two wooden-handled spatulas or two chopsticks. 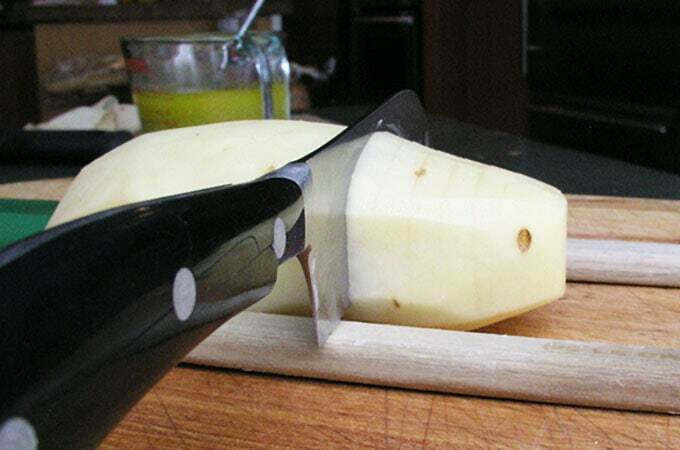 The wood on either side of the potato will keep you from cutting all the way through. Place the sliced potatoes on a jellyroll pan. Give the dressing a whisk and spoon 1 tablespoon of dressing over each potato. Roll the potatoes around in the pan to coat them. Put the pan in the middle of the preheated oven and bake for 45 minutes. Pull the pan out of the oven. Give the dressing a whisk and spoon another tablespoon of dressing over each potato, aiming to get it to slip into the slits that have started to open up. Return the pan to the oven and bake another 20-30 minutes, until the potatoes are nicely browned on the outside. Add the lemon zest and parsley to the dressing and whisk. Spoon 1 tablespoon of dressing over each potato. Serve and enjoy, passing extra dressing on the side! Curious if you’ve tried the recipe with butter or part butter & part olive oil? Thanks! Deb I haven’t tried it with butter but I’m quite sure it would be delicious with full or part butter – let me know! Lisa, these look amazing cant’t wait to try! Oh, my! These have got to be the most succulent potatoes I’ve seen! Love the way you prepared them. OK – finally tried these last night. They looked just like your pictures and tasted just as good as they looked! Made the Lime Apricot Chicken Wings too. They were awesome! These look unbelievable. Can’t wait to try the recipe! Sweet. I’ve seen these but not tried them. How do you decide which country to “do” next? And what is/are your recipe source(s)? Mmmmm… Looking forward to more! Gorgeous! I can’t wait to try these. I am really excited to make these for our next Argentinian Asado. I usually do roasted potatoes but these look faaaabulous! Seriously, those are the most appetizing potatoes I’ve ever seen! I’m really enjoying your cooking blog! If I read it when I’m hungry then I don’t seem to be as hungry after I’ve read it through. Maybe this is a good diet suggestion! Please give our very best to Ed and the children.